The first thing that strikes you about Dr. Howard is that she's an African American woman in a field where both are rare. 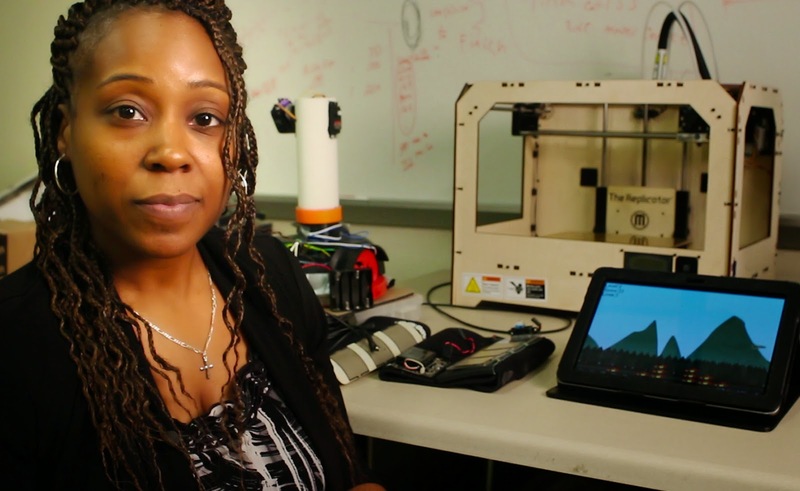 Women aren't often found in robotics labs, and African Americans are rare as well, so to have an African American woman achieve her level of success is a feat to be praised on its own. Now let's look at her accomplishments. In 1990, she started working as an intern at NASA's Jet Propulsion Lab. She rose up through the ranks, becoming a member of the Telerobotics Research and Applications Group and the principal investigator of the Safe Rover Navigation Task. 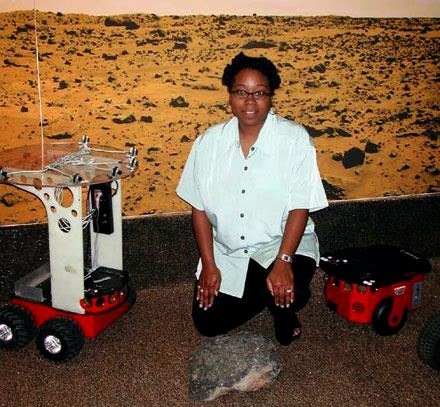 Her team worked on helping planetary rovers to navigate independently over challenging Martian terrain. "In essence," she said in a NASA interview, "[we were] mapping human intelligence to an aerial robot, such as a robotic spacecraft." In 2001, she received the Lew Allen Award for Excellence in Research - that's the highest possible honor at JPL "to recognize and encourage significant individual accomplishments or leadership in scientific research or technological innovation by JPL employees during the early years of their professional careers." In 2003, she was named to the MIT Technology Review TR100 as one of the top 100 innovators in the world under the age of 35. She was also featured in TIME magazine's "Rise of the Machines" article in 2004. In 2005, she joined the Georgia Institute of Technology as an Associate Professor. While working in the School of Electrical and Computer Engineering, she founded the Human-Automation Systems Laboratory. She earned her M.B.A with a concentration in Strategy from Claremont Graduate University in 2005. In 2008, Howard received worldwide attention for her SnoMote robots, designed to study the impact of global warming on the Antarctic ice shelves. What inspired Dr. Howard? The classic TV show, The Bionic Woman. When she was twelve years old, the show made her decide she wanted to make robotic limbs. However, her first biology class inspired her to change course. Says Howard, "The whole concept of being a medical doctor was not appealing, but I took a real interest in this thing called robotics, which was fairly new, and not a lot of people were doing it." That allowed her to continue to work on mechanical limbs without having to deal with blood and guts. But Howard's work extends outside the laboratory. In her spare time, she goes to local schools to talk about robotics, reads at the library to children, and helps with cultural arts festivals for unknown artists to get exposure with the community. "All the community efforts actually occupy a lot of my time, but it's fun because they're social activities with a good cause," she said. "It's really rewarding when you hear people say, 'Maybe I can do that,' or 'I want to hear more.' I look at their eyes and think, 'Wow, I really do have a cool job.'" Howard is especially concerned about young girls who decide they can't pursue careers involving math and science because of negative experiences or peer pressure. She said, "I think the problem is that parents and teachers allow girls to give up at such an early age, so I try to encourage them. They don't have to be nerds that wear glasses and pocket protectors; they can still join clubs and play sports. Getting into math or science doesn't mean they have to lose their social aspects." Our interview went to the topic of robot police officers. In CHAPPiE, autonomous robots are sent into the city to deal with crime in South Africa. With the recent conflicts between police and minorities, especially with the worldwide reaction to police officers confronting protesters with tanks and automatic weapons, I wondered whether Dr. Howard thought robot police would hurt or help relationships between police and the inner city. While I saw it in a negative way, Howard was much more optimistic. She said, "I don't think it's just about having robot police. I don't think that's the answer. It's that when robots are part of our day to day...you see a robot police [officer], or even a robot caretaker, then it's not looking at robot police as a weapon. It's just another autonomous option." We ended our interview with a game of "Would You Rather." We asked her if she would rather have super-strong prosthetic arms or legs. She almost immediately responded with "my arms. Walking is such a complicated function, so much more complicated than grabbing something. Even back in the day of the knights, they had arm prosthetics; very simple and crude but functional. And so there's a lot more advances in upper arms than there is in lower limbs." I did not know that. From the director of District 9 comes CHAPPiE, starring Sharlto Copley, Dev Patel, with Sigourney Weaver and Hugh Jackman. In the near future, crime is patrolled by an oppressive mechanized police force. But now, the people are fighting back. When one police droid, Chappie, is stolen and given new programming, he becomes the first robot with the ability to think and feel for himself. As powerful, destructive forces start to see Chappie as a danger to mankind and order, they will stop at nothing to maintain the status quo and ensure that Chappie is the last of his kind. Columbia Pictures and MRC present in association with LStar Capital a Kinberg Genre production, Chappie. Starring Sharlto Copley, Dev Patel, NINJA and ¥O-LANDI VI$$ER, Jose Pablo Cantillo, with Sigourney Weaver and Hugh Jackman. Directed by Neill Blomkamp. Produced by Neill Blomkamp and Simon Kinberg. Written by Neill Blomkamp & Terri Tatchell. Executive Producer is Ben Waisbren. Director of Photography is Trent Opaloch. Production Designer is Jules Cook. Editors are Julian Clarke, ACE and Mark Goldblatt, ACE. Visual Effects Supervisor is Chris Harvey. Music by Hans Zimmer. CHAPPiE hits theaters on March 6, 2014. What do you think of Dr. Howard? Walking is more complex than arm movement - didn't know that either. She is quite accomplished. And at such a young age. Plus I like that she focuses so much on community work. Wow! Dr. Howard is incredibly accomplished! My oldest daughter is into science and is thinking of biochemistry, bio-engineering, or robotics as majors; so it's good to see an article/post about a woman in one of those fields. On the walking part: my dad has a prosthetic leg, and although they've made advances, I've seen how complex movement for a foot and ankle are, and when the knee joint is involved it's even more complex. We take a lot of our balance and coordination while walking for granted. I like her approach to robotics. Seeing robot police as "... just another autonomous option."